Airlock is a process to help partners collaborate safely and profitably, without fear of intellectual property contamination. Undergoing the Airlock process helps potential partners evaluate each other and prepare for a successful collaboration. Airlock is mediated by Trusted Agents that act on behalf of both innovation partners to ensure an equal playing field, effective communication and a long-lasting relationship. "We never have confidential conversations." Mike Addison, Procter and Gamble. There are three phases: Select, Develop, Embed. 1.1 Do we need an Airlock? Decide whether you definitely need an Airlock to effectively engage Innovation Partners. If the answers to the following questions are yes then an Airlock will help. • Are IP concerns likely to be a barrier? • Are the differences in culture and process likely to present a challenge to effective collaboration? • Is there a lack of negotiating skill in either party? Is there a significant imbalance of power? Who are they, what are their qualifications and how much are they going to be paid and on what basis (retainer, consultancy fees, success fees, profit share, equity)? 1.3 Are appropriate Non-Disclosure Agreements (NDAs) in place? It is usual for the Trusted Agents to sign an NDA with their client – either the Challenge Holder, the Innovation Partner or both as appropriate. Take legal advice about the specific NDA terms if unsure. Sometimes a standard NDA won’t allow enough freedom to communicate, especially if one Trusted Agent is representing both parties. 1.4 Have you briefed your Trusted Agent(s) comprehensively? Do your Trusted Agents understand your innovation needs well enough (including technical factors) to effectively represent them to your intended collaboration partners? Do the Trusted Agents understand your concerns (about IP or otherwise) well enough to competently respect and manage them during the process? Have you clearly defined what can and cannot be shared? • How long will the Airlock process last? • Who will be responsible for which aspects of the process? • Will development workshops be used? • What development support or coaching will be provided? • Do you need to invite IP lawyers into the process? • Is the Challenge Holder providing any development funding? • What will be the ultimate go/no-go decision criteria? • Have you agreed the Challenge Holder’s time limit for a decision? 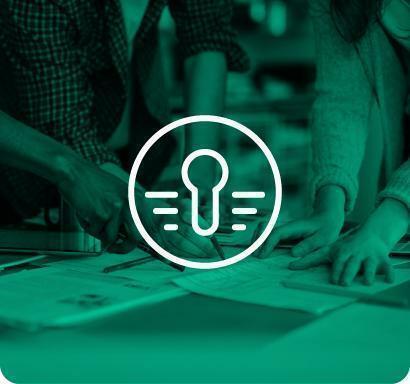 As well as coaching and support, the Innovation Partner will sometimes receive direct development funding to reward being selected for the Airlock and to incentivise the effort made to develop their propositions. Has the Innovation Partner constructed the best pitch it can? It is important to construct a compelling pitch in the Challenge Holder’s language so that there is clear value for the client wrapped up in a realistic collaborative business model. The Innovation Partner should rehearse and polish their presentation. What date is the final pitch and who are the judges? Has the Trusted Agent prepared scoring sheets and other background information for the judging panel? Have you considered what contractual outcome you are looking for? 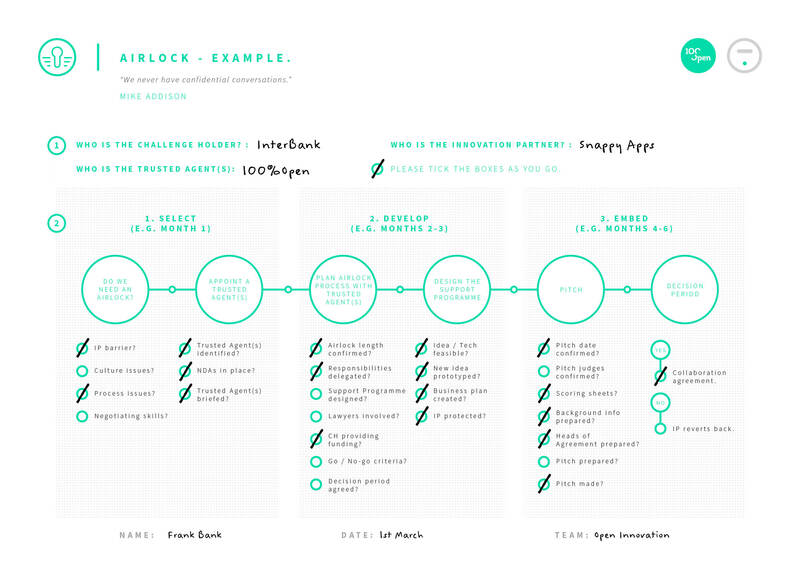 The final objective of the Airlock is to produce a Collaboration Agreement (or other legal documentation that signals the intent to continue the relationship) between the Innovation Partner and the Challenge Holder. This should include a plan for further development and commercialisation plus an agreed business plan and IP strategy. See IP Strategy for a more in-depth approach to intellectual property. Use Pitch Template to prepare to give or receive business pitches. Our Collaboration Agreement outlines a template for the final outcomes of an Airlock. Whilst considering idea or tech feasibility use the PPP Filter to evaluate alternatives. Whilst considering the business plan, look at Collaborative Business Canvas and Open Innovation Models for alternative ways to structure the relationship.